Flowers That Say "I'm Sorry"
The traditional apology gift is a bouquet of flowers and a heartfelt card, coupled with a few weeks of copious groveling for forgiveness. 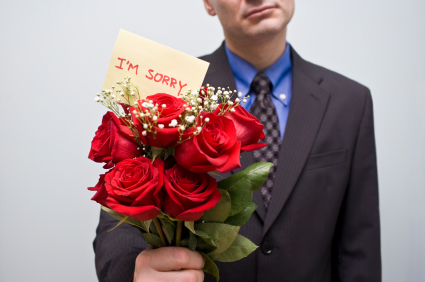 The right bouquet, though, can drastically reduce the apology time. The "I'm sorry" bouquet conveys several messages: giving the bouquet indicates that you know you were wrong and that you want to make things right. The card allows you to explain just how wrong you know you were and how very much you want to make things right. Finally, your choice of bouquet indicates how much time you spent trying to figure out the perfect gift to start making him or her happy again. The last option is very important. By choosing a flower arrangement that suits your significant other's tastes, you are showing that you took the time to think about them and what they like. Since one of the major factors in arguments is failure to take the other person's thoughts or opinions into consideration, an apology bouquet that shows you are trying to think as they do is a good way to show that you are trying to fix the situation. Step 1: Find the appropriate flowers. If you know your significant other's taste in flowers, you may proceed to Step 2. Otherwise, think about clues such as a favorite color. What colors does your other half wear most, decorate with, or prefer? Look at their favorite items of clothing if you are stuck. If you still cannot find a favorite color, think of where your significant other likes to hang out in their home. People tend to decorate areas they like with colors they enjoy. Pick out the key color elements in that room that your significant other added personally, such as the wall colors or shades on the posters or art. If you are still at a loss, think of a favorite happy memory the two of you shared. This can be a favorite shared space, an object you bought together, or any happy event. Make sure it is an event the OTHER person enjoyed. (That awkward first dinner with your parents where everyone asked after your ex is not a good memory, even if you had fun.) Pick out one or two strong, identifiable colors from that memory and use those to guide your bouquet. Make a note in your card as to why you chose this shade: "The yellows and reds reminded me of our vacation to Vermont and how much fun we had. Let's continue making wonderful memories." Step 2: Find a bouquet using those flowers. Once you have a color in mind, go to an online or local florist and sort through the bouquets, looking for your main color or flower. Many online sites will have the option to search by color. Local florists will be happy to guide you to an appropriate bouquet. Step 3: Write a thoughtful card. Do not forget the card. Flowers alone are just plants; flowers with a note are a wonderful symbol of your love, affection, admiration, and deep regret at hurting your other half's feelings. Avoid promises in the card, unless they are really necessary. ("I promise we'll never fight again!" is not a good idea.) Be brief (unless you really messed up) and focus on how much you love the other person, how sorry you are to have hurt them. Close with a brief apology, a statement of hope that you can work past the conflict, and a reiteration of your love.